Sway Calloway hosted Kanye West this morning on his Shade 45 radio show and needless to say things got a little crazy. 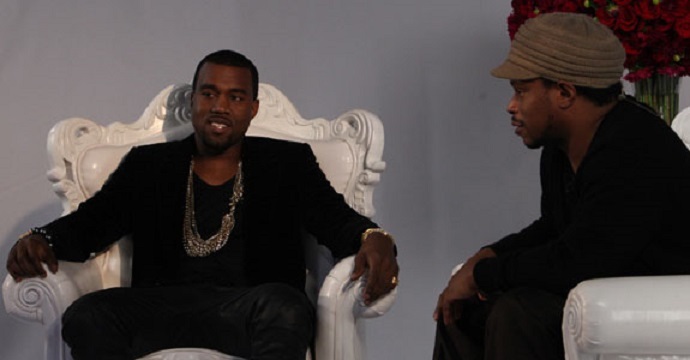 As Kanye opened up about his aspirations to break in the fashion industry on a large scale, Calloway proposed the question as to why the rapper doesn’t start small and fund his own dream. As a result, Yeezus lost it and got real aggressive in his tone as he repeatedly claimed that Calloway didn’t have the answers to his problems and didn’t know what he was talking about. Take a listen to the shouting match as Sway attempted to calm the atmosphere in the room and encourage Ye to chill out on several occasions. This entry was posted in Audio, Interview and tagged heather b, hip hop, Interview, rap, Shade 45, spaz out, Sway Calloway, the sway calloway show. Bookmark the permalink.